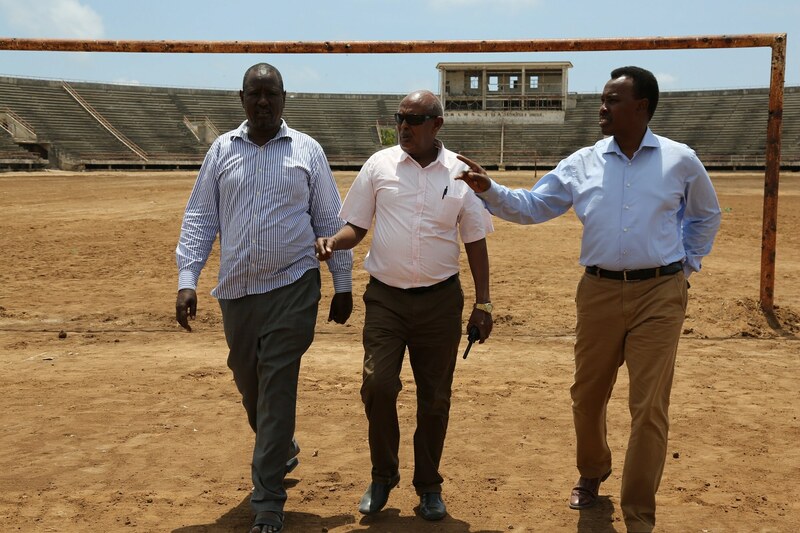 October 24 – The return of Somalia’s national stadium to football usage took a symbolic step forward this week with members of the government and the football federation leading a clean-up operation at the venue. The Somali Minister for Youth and Sport Khadija Mohamed Diriye was joined by Somali Football Federation (SFF) President Abdiqani Said Arab, his deputy Ali Abdi Mohamed and a host of volunteers as they continued work on cleaning the stadium, which was recently vacated by African Union Peacekeepers after being used as a military base. The stadium, which last hosted a game in 1988, was a base for the African Union Peacekeepers during the Somali Civil war and had fallen into disrepair over that time as the situation in the country remained unstable. SFF President Abdiqani Said Arab is looking ahead to a return of the stadium to football use. “The cleaning process, led by the Minister of Sport, is meant to pave the way for the near-future renovation of the stadium,” he said. The Minister for Youth and Sport was also optimistic about the future of the stadium, saying: “For many years, Stadium Mogadishu has experience the most difficult times in its history. The cleaning campaign saw participation by volunteers including government officials, local footballers and members of a Somali expatriate Football team, who are in the country on an invitation tour to play friendly matches with four Somali Premier League teams.